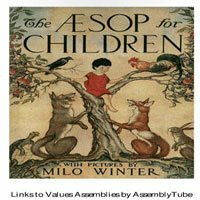 A collection of Aesop’s Fables with links to Values Assemblies on the AssemblyTube website. Aesop’s Fables are an essential for every Assembly Leader’s Library. Great stories with a moral message. This AssemblyTube version has the added feature of links to Assembly ideas.